Today marks one week since the tragedy at Sandy Hook Elementary in Newtown, Conn. The Internet has come together, as they often do in cases like this, to try and show their support. I wanted to pass along a few of the great projects I've found. 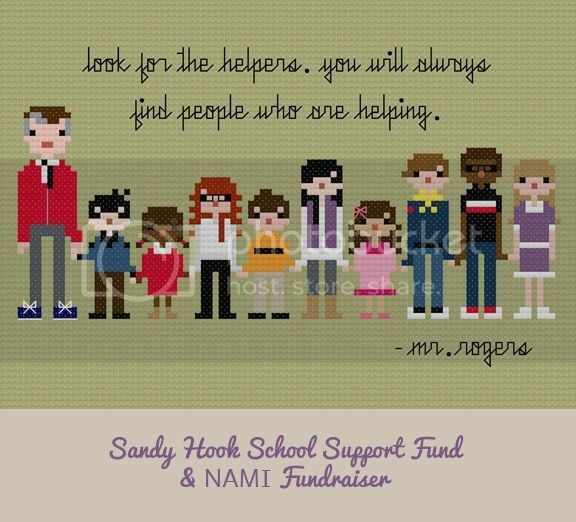 All of the proceeds from the sale of this crosstitch pattern will be split between the Sandy Hook Support Fund and the National Alliance on Mental Illness (NAMI). The pattern was inspired by a Mister Rogers quote: "When I was a boy and I would see scary things in the news, my mother would say to me. 'Look for the helpers. You will always find people who are helping.' To this day especially in times of disaster, I remember my mother's words, and I am always comforted by realizing that there are still so many helpers—so many caring people in this world." Newtown's heartbreak has a lot of us asking, "What can I do?" Thinking about this, I took to Twitter and asked people to imagine what would happen if all of us committed to 20 acts of kindness to honor each child lost in Newtown. I added, "I'm in. If you are, RT #20Acts." Tens of thousands of people on Twitter and Facebook not only seized the idea, they increased it to #26Acts, to include the heroic teachers, and are launching acts of kindness big and small all over America. The acts are spreading overseas, including one tweeted from Borneo. This one can be done on so many levels. Even if you don't complete all 26, even one small gesture might make a huge difference in someone's life. If you've heard of any more of these projects, please let me know in the comments and I will add them to the list. That's wonderful! I hope it goes (or went) well! It probably speaks to the level of emotional response I had to this tragedy that every time I see that Mr. Rogers quote anywhere now, I almost immediately tear up. I love the #26Acts idea, and I'm really thinking on how I can make that happen. Thanks for this post. Inspirational and heartbreaking, all at once. It's definitely a moving quote and it resounds in times like these. Thanks, Sharripie! I'll have to check out that project, too.